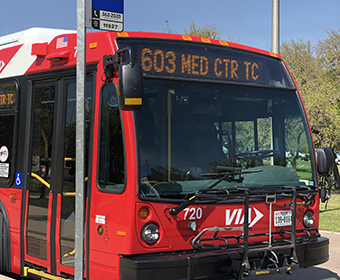 (March 20, 2019) – UTSA today announced a new partnership with VIA Metropolitan Transit that provides the entire university community with free bus passes to transport them between campuses and throughout San Antonio. Beginning with the fall 2019 semester, VIA will provide free, unlimited access to bus service anywhere in the city for current students, faculty and staff. As San Antonio’s urban serving university, the VIA U-Pass program will offer cost savings and sustainable commuting options for all Roadrunners. The program—which will be funded fully by UTSA without any student transportation fee increases—will make it easier for Roadrunners to leave their cars at home, reducing congestion on campus roads and parking lots. VIA has a wide range of routes across the San Antonio region, including route 93 and route 94 which provide convenient and quick transportation between the university’s Main and Downtown campuses. UTSA’s campus transit system, The ’Runner, will continue to provide Main Campus transportation to and from on-campus parking lots and select nearby apartment complexes. Additionally, campus ride sharing programs are currently being explored under the leadership of UTSA’s new Vice President of Business Affairs Veronica Mendez. University administrators first began looking into the VIA collaboration after an internal survey initiated by the Downtown Campus Task Force showed strong interest on the part of students and employees in alternative transportation options between campuses. U-Pass riders must be currently registered UTSA students or full-time or part-time paid employees of the university. To board a VIA bus, riders will use the VIA goMobile ticketing app as their credential. All VIA buses offer instant access to the Bexar BiblioTech e-library and free 4G LTE Wi-Fi, allowing students and employees to stay connected while traveling. VIA will monitor ridership and route use by the UTSA community, with the option to adjust routes as needed. Get VIA routes and service information. Learn more about on-campus transportation and parking.